Including : Rebore, new pistons, rings, small\big ends etc, all this work and other work is documented. The car is now MOT’d till June 2017, Full 12 Months. I have all the MOT’s back until 1990 with mileage showing 113k. It is for sale on behalf of a good friend of mine, He purchased the car around 2 years ago. He has done very few miles as he works away on a regular basis. Below is a copy of a letter from the first owner of the car. “During the period of 1979-1980, it had become almost impossible to purchase a 350 SL in England without paying a premium of up to 5,000 GBP. Consquently, when i saw a white mercedes, as the central display, on the largest stand at the Belfast Motor Show, i had no hesitation in purchasing it at list price! VOI 100 (orignal registration number) was purchased directly from Isaac Agnew stand at the Belfast Motor Show. Since it was first sale to be made by any of the exhibitors at the show, the sale was heralded by the local press and radio. Its sale was seen as a symbol of the potential success of the motor show as a whole. Photo’s of the car with Miss Northern Ireland, were taken by local newspapers, and interviews with myself and the directors of Isaac Agnew took place on local radio. Since Feburary 1981, when first registered in england, the car has only driven by me. As chairman and managing director of Super Stork (IPT) LTD U.K Subsidiary of an Italian swiss engineering group; All of the cost of the repairs and maintenance of the car were always carried out at the companies expense. The work was always carried out to the highest standard, usually by Alan Day Ltd, and Mercedes Colindale LTD. Mercedes specialist G.D Long was retained to carry out all of the maintenance . On my retirement in May 1991, The Mercedes formed part of the negotiated package. It was agreed that bodywork be carried out on behalf of the company, By Normand of Mayfair LTD, i Appointed ex Alan Day Motor Technician and Mercedes Specialist, Sean M Ward to remove and totally rebuild the engine out at 123,000 miles, is fully documented. The service history covers the previous periods. 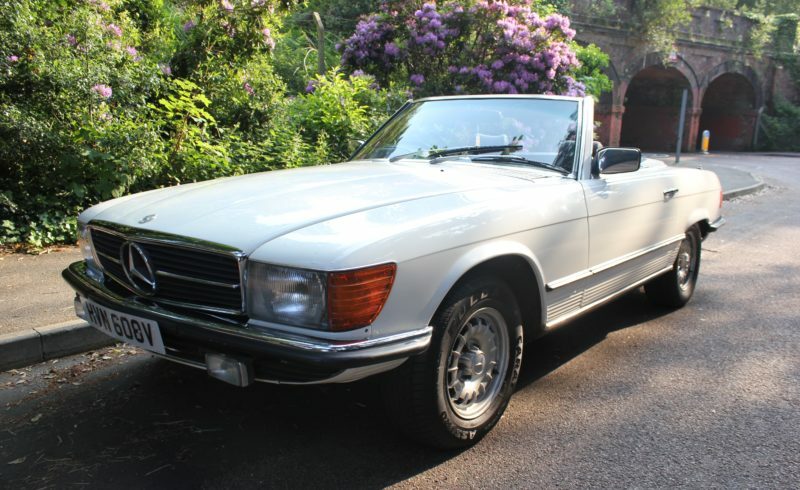 This was the 452nd last 350 SL ever made, with a total of only 243 built in 1980. It is fact a 1980, not 1979 as registered.